Perusing the web for my old recordings, I came across the "Toby Peters" series by Stuart Kaminsky, read by "Tom Parker." 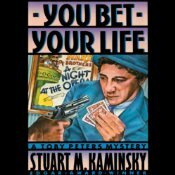 Kaminsky has written some fairly hard-hitting stuff, including a series about a Pittsburgh cop and another about a Russian police inspector, but the Toby Peters books were fun little romps involving a private eye operating in 1940's Hollywood. They featured an amusing cast of secondary characters, including a Swiss midget and a batty landlady. But what really distinguished them was that each one featured a famous movie star from the period, who was in some sort of fix and needed Toby's help to straighten things out. Thus, A Fatal Glass of Beer involves a road trip with W. C. Fields as he tries to rescue his numerous, far-flung bank accounts from the clutches of an imposter posing as one of Fields' own fictional radio characters. In You Bet Your Life, Chico Marx has gotten into dutch with some gangsters over a gambling debt, and his brother Groucho hires Toby to get him off the hook. Fred Astaire is being bothered by women and mobsters in Dancing in the Dark, which features an especially funny sequence in which Peters stumbles into a musical number with Betty Grable. And so forth. The writing was snappy and the protagonist was an endearing schlumpf with one clean suit and a perpetually empty wallet. What made them unusually challenging, however, was that you had to muster a pretty fair imitation of a different celebrity for each one. Sometimes they were little more than cameos, but at other times they dominated the book, as in A Fatal Glass of Beer. I'm a classic film buff and managed to memorize most of the W. C. Fields and Marx Brothers movies when I was a kid. Even so, it's not an easy trick to pull off. It's one thing to imitate a few famous lines, but to place that particular voice and character into a completely new setting is difficult. Listening with trepidation to the samples on Audible, I think I did okay, even if my W. C. Fields sounds more like Jimmy Stewart than W. C. Fields. What struck me most, however, was how sleek and charming the writing is, and I found myself sitting back and going along for the ride all over again, after all these years. If you're in the mood for something light with an extra twist, you'll enjoy them.